For me, soup is the perfect cold-weather food. Sometimes, all you need is a bit of variety to feel satisfied. Asian soups are great for variety because they tend to be a collection of ingredients in a broth rather than a homogenised puree. Every mouthful is different, so it can be a little more exciting to eat than spoonful after spoonful of the same thing. 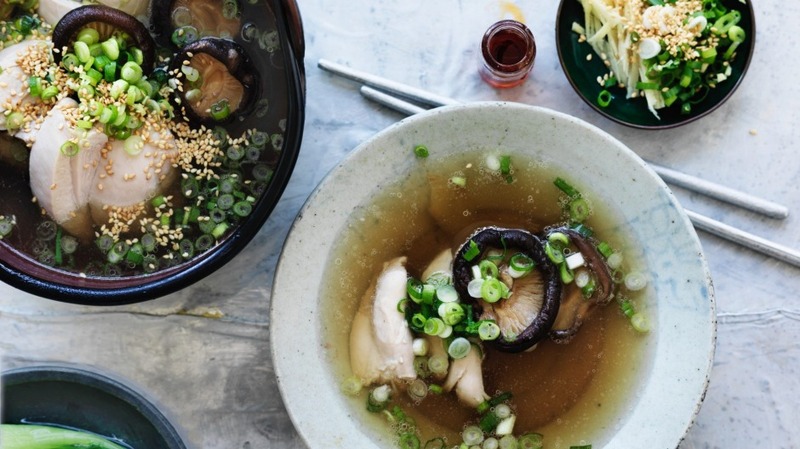 This clever Chinese soup uses a stock made from soaking dried mushrooms as a delicious savoury base. 1. Bring 2 litres of water to the boil in a large saucepan and turn off the heat. Rinse the mushrooms under running cold water, and add to the hot water. Allow to stand for 30 minutes, then remove mushrooms from the liquid. Trim and discard the stalks and keep the caps. 2. Return the liquid the mushrooms have steeped in to the boil and add the Shaoxing wine, soy sauce, ginger and garlic. Simmer for two minutes, then taste the broth and adjust for seasoning – it will need a little salt. Add the chicken thighs, pak choy and mushrooms. 3. Reduce the heat to very low and simmer, covered, for 12 minutes, skimming any scum that rises to the surface. Remove the chicken, slice it into 3cm-wide slices and return it to the pot. Remove the ginger and garlic and discard. Divide the ingredients evenly between four warmed bowls and pour over the broth. Scatter with spring onions to serve. For dessert, try Adam Liaw's Japanese Nutella pancakes.